When hospitality is envisioned by a French fashion designer, you know you can expect loads and loads of artistic and design details. And when it's hospitality by a 5 star hotel, you can expect the best service, food as well as ambience. Imagine when the two come together. At Sofitel So Bangkok, everything is more than just above par. Designed by world famous fashion designer Christian Lacroix, this latest addition to the Sofitel So family overlooking Lumphini Park is hip, urban and sophisticated. It's so hip, it comes with themed accommodation that's created around Five Elements - Water, Earth, Wood, Metal and Fire. With 238 guest rooms and suites, you are bound to find a room you like at Sofitel So Bangkok. Of course, it's a bonus since you get to pick the room with your favorite Element, instead of only having choices such as twin sharing, superior or deluxe like in most hotels. Just look at the hotel staff's chic uniform at Sofitel So Bangkok! They made me feel like I was walking around the backstage of Paris Fashion Week. Apart from the fact they were full of smiles (yes, I know models hardly smile), their uniforms, designed by Christian Lacroix himself, were just beautiful. Little details of the pleating and various fabrics put together made each and every one of the staff look fashionably fabulous - like high fashion models. 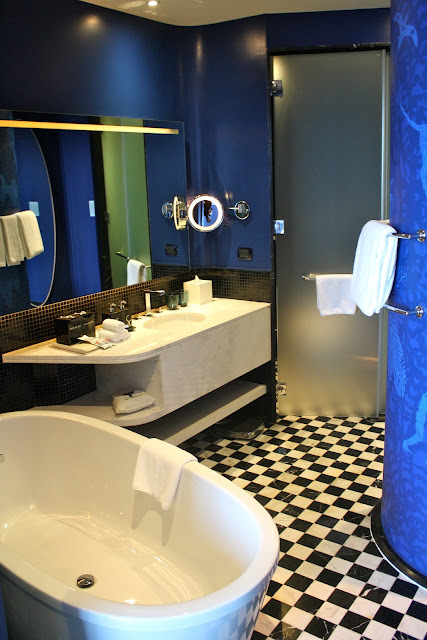 The Water Element room (which I stayed in) allows you to experience sophistication and calmness. 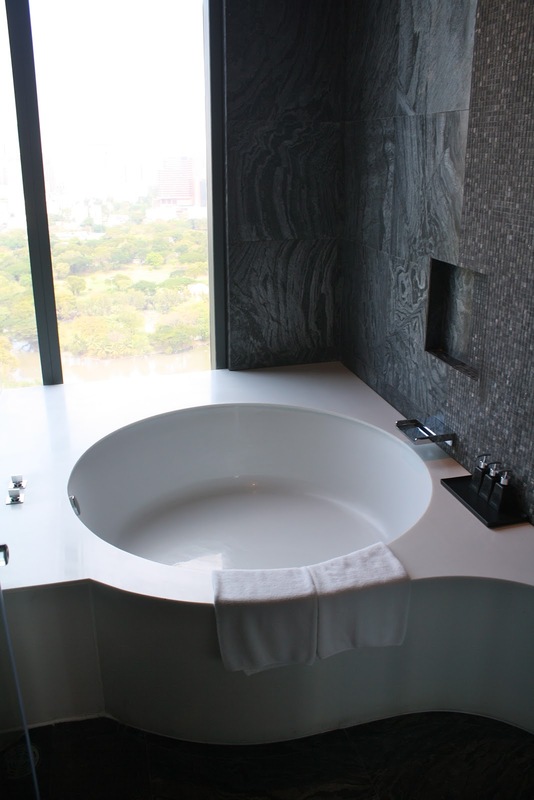 The highlight of the room has to be the onyx bathtub, which comfortably fits two, if you get what i mean. I especially like how they take note of the small details of each element, which also explains the fighting fishes on the study, since it was "water element". The Metal Element room gave a more chic appeal. The white shades of the room made it futuristic and tranquil. And instead of fighting fishes placed on the table, you get Baoding Balls. This is perfect for the traveling businessman or businesswoman who just wants a place to rest after a hard day of wheeling and dealing. If you are someone who likes contemplation and ideas, go for the Wood Element rooms. This Zen-like setting is perfect for musing about the meaning of life while you gaze at the vast expanse of Lumphini Park. Check out the cool chair, which I really wanted to bring home as well. And finally there is the Earth room, with its cave-like setting. The walls are covered with drawings, to make it look like caveman drawings. I think young kids would love this room. But for me, I prefer the more sophisticated rooms like Water and Metal. And if I was in a more serious thoughtful mood, I would go for the Wood room. The four elements, Wood, Water, Metal and Earth, were all inspired by the elements of Lumphini Park itself - which the hotel overlooks. You see the trees (wood), the ground (earth), the ponds (water), as well as the city skyline (metal). What a terrific concept! Your eyes are not playing tricks on you. Yes, each room is equipped with technology at its best, just like how the other parts of the hotel are. Each room has an Apple Mac Mini connected to the television, along with a wireless keyboard and trackpad - which also means email and social media at your fingertips. No need to bring your laptop, if all you want is to surf the Net and check email now and then. 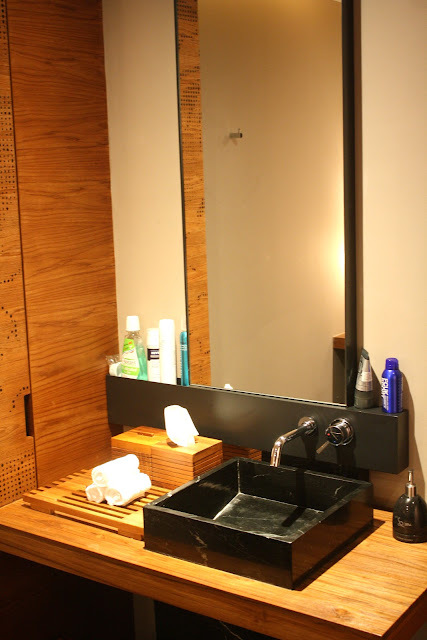 Apart from that, there is also complimentary minibar where everything is for free and replenished daily. The amenities at Sofitel So Bangkok includes an infinity pool overlooking the skyline of Bangkok's CBD. Beside the pool is So FIT, which is a full-service fitness centre with high tech equipment and a personal trainer. At So SPA, a range of products from Ystara from body scrub to massage oil is used to ensure you get the best out of all their treatments. I especially liked the aroma oil used for the Swedish massage when did not leave me feeling like a piece of fried chicken refried for the umpteenth time. So SPA has 7 different rooms, for both couples and individual. They offer a range of massages from Thai to Swedish to Balinese. Dining at Sofitel So Bangkok is aplenty. If you have a sweet tooth, you should check out Chocolab located on the first floor. If you like buffets, Red Oven serves up international market-style food with a contemporary twist. And if you are the kind that goes for ambience, go for Park Society on the top floor of the hotel, which serves fine dining overlooking the city lights. Really, i could stay in the room all day and be on the Apple Mac Mini. And when i'm hungry, there's always a place to satisfy that craving, whether sweet or savoury. Of course, there's also So SPA for you to soothe those muscles if you need to, or get a reflexology after a day of shopping. Cliche as it sounds, i am So coming back for more. nic please dun forget to go pray the famous temple!!! !